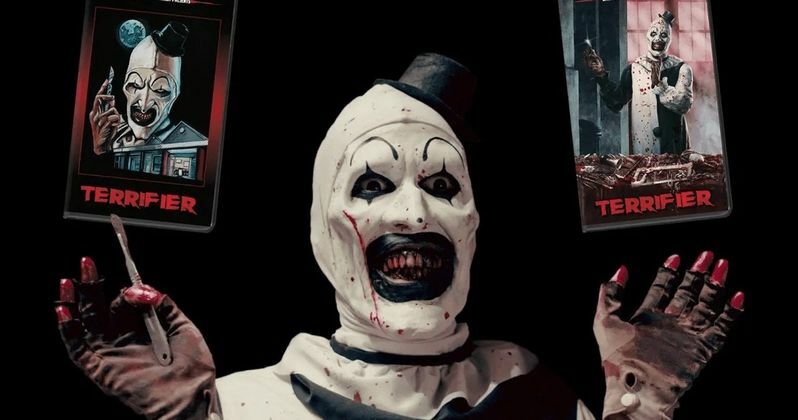 Writer and director Damien Leone's clown horror movie Terrifier is one of the best modern slasher movies, and Broke Horror Fan has announced it will soon release the movie on VHS. The limited edition release will have two covers for buyers to choose from, with the tape coming in a black clamshell case. The standard edition features artwork from Vasilis Zikos, coming with a first pressing of 150 copies. The variant, with cover art from Fangoria's Steve McGinnis, is more limited with a pressing of 50. Every copy will also include a letter from Leone with an introduction by David H. Thornton who plays the movie's killer clown. Special features can also be viewed on the VHS tape following the movie. Of course, for optimal viewing, the movie will be presented in a 4:3 full frame format. Based on a short film of the same name from the horror anthology movie All Hallows' Eve, Terrifier focuses on the murderous exploits of a sinister clown named Art. The clown stalks three women on one fateful Halloween night, murdering hapless souls in horribly violent ways along the way. Incredibly graphic and yet oddly comedic, there's a certain charm to Terrifier, making it one of the most must-see horror flicks in recent history. Previously, Leone had announced he'd finished the screenplay for Terrifier 2, making it clear he plans to bring back Art in an official sequel. Terrifier had its world premiere in 2016 at the Telluride Horror Show Film Festival. After a positive response, it was screen again later at the Horror Channel Frightfest the following year. The movie was then purchased by Dread Central Presents and Epic Pictures, who then screened the movie in 2018. Terrifier was then released on DVD and Blu-ray in March of last year, coming with several bonus features such as deleted scenes, interviews, behind the scenes footage, and an audio commentary with director Damien Leone and star David H. Thornton. Although the movie has had a packed home video release, however, VHS collectors will still be most excited to watch the slasher flick on the classic format. This is not the first VHS release from the Broke Horror Fan Presents line of movies on home video. Among other movies, Adam Green's slasher sequel Victor Crowley was given the VHS treatment by the company, and is now available to purchase on the website. Featuring artwork from Dark Horse Books illustrator Will Perkins, buyers can choose from three different covers for the tape. This includes the standard edition, a bloody variant, and a limited line-art variant with Perkins' signature. Both variants also come with a blood-splattered letter from Adam Green to his fans. It's also noted that the VHS presents the movie with a 4:3 full frame aspect ratio for optimal viewing, as with most VHS releases from the past. If you enjoy horror movies on VHS, this would certainly make a great addition to your collection as one of the most-talked about modern slashers. The more modern horror movies on VHS that sell will result in similar releases to continue rolling in from the company, and it plays a big part in keeping the once-dying format alive. Terrifier on VHS will be sold exclusively from Witter Entertainment starting on Friday, March 29 at 12 p.m. EST.